Non-stick cooking pans have become popular since the last decade because of their easy use and convenience in cleaning. The problem with these cooking pots is the toxic chemicals that have several dangers for health. The type of cooking ware is often overlooked when cooking healthy foods. However, making the right choice is very important to save your meal from sabotaging. Toxic chemicals from the cooking ware can get absorbed in the food cooked which makes the healthiest foods as the most dangerous ones. Therefore, considering the right type of cooking ware is essential if you want to save yourself from the unnecessary toxins. Teflon cookware is linked to many health disorders including cancer and fertility problems. It is considered as the most dangerous type of cookware as the coating is achieved with a special method which evolved toxic fumes on heating. They get preheated over the safe temperature limits given by the company itself which turns toxic on the high burner. 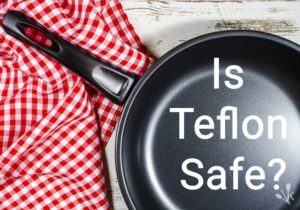 The temperature limit for Teflon is 660 degrees Fahrenheit which easily exceeds within minutes of heating the cookware. On reaching 680 degrees Fahrenheit, Teflon cookware produces six toxic gases which can lead to polymer fume fever when inhaled. Polymer fume fever may include symptoms like flu and can be very dangerous for health. The chemicals released can be lethal for humans as well as birds and so alternatives should be opted to keep yourself and the environment safe. Moreover, toxic fumes are so harmful that they can lead to breast, prostate, and ovarian cancer. Copper cookware looks stylish and elegant only on the outside as uncoated copper can easily leach into the food you cook. Copper is popular because of its conductive properties which make the cookware evenly heated very quickly. While the uncoated copper may cause problems with leaching food, the coated one contains nickel which is extremely toxic itself. Nickel is also known to cause allergic reactions which are not a good choice in any case. Also, excessive copper in the diet decreases zinc levels which account for proper immune system. Suppressed zinc levels in the body are known to cause malfunctioning of the adrenals and other glands of the body. Zinc is an essential nutrient for the body which is why individuals often take dietary supplements to overcome the deficiency. Although you may have seen various dietary supplements containing copper as it is only important for the human body in small quantities. Excessive amounts of copper can be devastating for health and may cause several problems like heavy metal poisoning. Better alternatives are available for each of the toxic cookware. Even copper cookware can be replaced with better materials that can be heated quickly and conveniently. It is recommended to choose wisely and stay away from leaching products. Aluminum cookware has been linked to nervous system problems as exceeded aluminum levels are harmful to health. Aluminum itself is pretty dangerous and its cookware is often coated so as to prevent the leaching process. 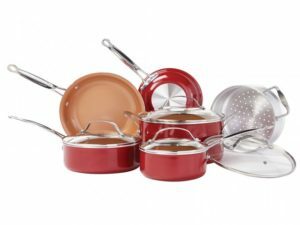 Like other non-stick cookware, coated aluminum is known to chip and deteriorate which does no good for health as the food gets exposed to aluminum again. It is therefore recommended to opt for the greener companies manufacturing safe products and don’t risk money while buying toxic materials for cooking otherwise healthy organic food. High levels of aluminum used for cookware will cause problems with the nervous system which include various conditions like Alzheimer’s disease and autism. Soft ceramic is not a reliable material to use for cookware as it will start chipping easily. Several months of daily use will start damaging the cookware and its quality will not remain suitable for cooking food. The main elements that get into your food while cooking in ceramic coated cookware are lead and cadmium which get into your body to act dangerously in many ways. They may cause abdominal pain, headaches, and infertility problems in individuals which will be hard to cope with afterward. There are healthy alternatives to the toxic cookware which should be invested in for good health. It is also advised to look for the reliable manufacturing companies that have good name for providing customers with teh right product. 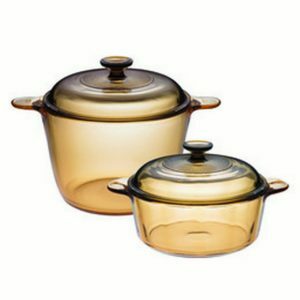 The glass is an absolutely safe choice for cookware as it does not produce any toxicity when heated. It is durable and safe for the environment too. Glass is one of the favorites of many individuals as it looks good and does not cause any harm. It does not deteriorate even if it is used for longer periods of time. No toxic fumes are produced when they are heated but the only concern is that is not suitable for frying purposes. 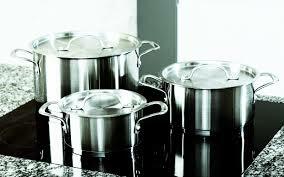 Stainless Steel is scratch resistance which will keep your cookware neat and clean forever. It does not cause any damage to your health which is the best part about it. 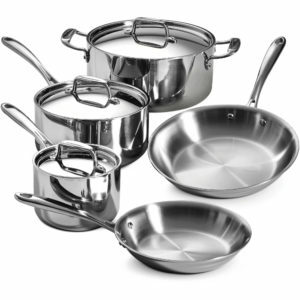 Stainless steel cookware are lighter in weight and are made resistant to chipping. They will not have scratches until long as the material is long lasting. However, only small amounts of nickel can leach from this cookware, it is not a big concern unless the food is simmered for longer periods. It is advisable to choose glass or other cookware for foods that have to be cooked for longer periods of time. 100% ceramic coated cookware is not considered to be dangerous for health as it does not emit any toxic fumes. 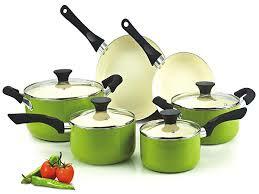 It is made up of natural materials which are all safe for use in cookware. This cookware is 100% safe from any chemicals and toxic materials as there is no other coating apart from ceramic. Therefore, it is better to opt for the 100% ceramic coated cookware to stay safe and keep yourself healthy. Cast Iron Cookware is known for consistent heating and it contains no toxic substances. 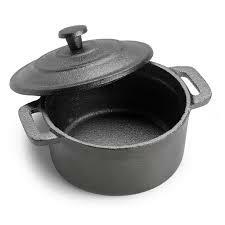 Also, the main benefit of using cast iron cookware is increasing iron levels naturally in the body. It should still be taken care of when long simmering of foods has to be done as this may cause some harm. There are two main types of cast iron cookware like enameled cast iron cookware and bare iron pans both of which are good alternatives of the toxic materials. The enameled cast iron cookware provides the non-stick properties of Teflon which will not emit any toxic fumes on heating. They will also require very little maintenance and can last long. The bare iron pans are known for their even heating properties but can also leach iron into the food cooked. Acidic foods like vinegar or tomatoes can cause leaching faster than other foods and so this should be kept in mind. Anemic patients can benefit greatly with such cooking pots as they can be able to overcome their deficiency while non-anemic patients should be careful about too much iron intake while using them. Choose the products of companies that are reliable and known for good quality. Use natural cookware wherever possible as that is the only healthy alternative to all other harmful materials. Also, don’t put your food on stake by choosing the wrong materials for cooking purpose as the healthy and organic foods will turn into the most dangerous foods when cooked with toxins and chemicals. It’s time to invest in healthy cookware as your health comes on a priority always.